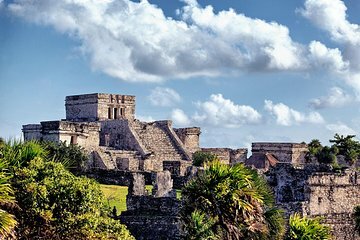 The Tulum Ruins are among the most visited Mayan sites on the Yucatan Peninsula, but they have the crowds to match. This early-access combo tour ensures you get there before the tour groups and combines it with a swim in a natural cenote and a visit to Playa del Carmen. Tour includes lunch, hotel pickup, and entrance fees. Comience su día con una recogida temprano por la mañana en su hotel central de Tulum a tiempo para una salida a las 5 am. Diríjase directamente a las ruinas de Tulum y aproveche al máximo su acceso temprano para admirar las impresionantes ruinas antes de que lleguen los autobuses y las multitudes. Primero, visite las ruinas en una visita guiada, aprendiendo más sobre la antigua civilización maya y la historia de la ciudad amurallada, que una vez fue un importante bastión maya. Disfrute de destacados como el Castillo, el Templo de los Frescos y la Casa del Cenote; admirar las espectaculares vistas de la costa caribeña; Luego disfruta de tiempo libre para explorar las ruinas de forma independiente. Continúe hacia un cenote natural, un "sumidero oculto" venerado por los antiguos mayas como un sitio sagrado, y aventúrese bajo tierra para explorar la hermosa cueva y refrescarse con un baño. Después de disfrutar de un almuerzo para llevar (incluido), diríjase a la última parada del día: Playa del Carmen, una de las ciudades turísticas más populares de la Península de Yucatán. 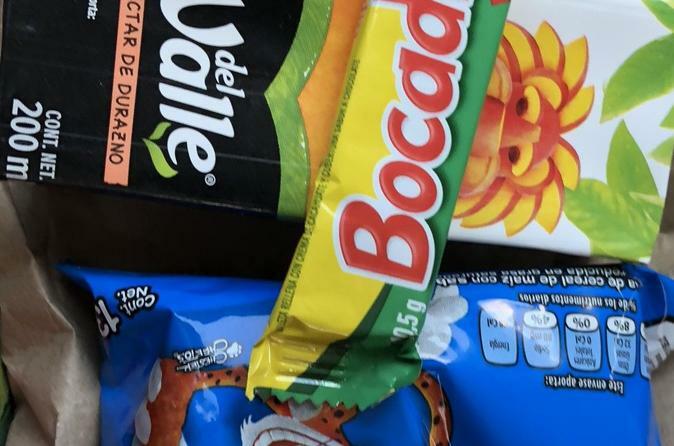 Disfrute de tiempo libre para ir a la playa, pasear por la animada ciudad o comprar recuerdos antes de regresar a Tulum. De regreso en Tulum, su recorrido termina con la entrega en su hotel. NOT for English tourists! When we asked both tour guides to translate they got rude and said they did. They gave very min details in English. We had to figure most of it out! We were not the only English speaking couples that felt this way either. We lived in the Cancun downtown area. A 20-minute walk lead us to the nearest pickup point where bus arrived at around 6:30 am. While entering the bus, we were served 'boxed lunch' picture attached. It consisted of a juice box, a small chocolate wafer, and a tiny packet of Cheetos Puffs. Mary from Amigo Tours our guide for the tour till Tulum very helpfully explained that this boxed lunch is just a snack and that they refrained from providing proper lunch to save us from an upset stomach. She said this while rubbing her belly and with an expression of immense pain. It made me wonder what were they planning on serving for lunch! Anyway, with the snack in our hands and sleep in our eyes, we started our journey to Tulum. No introduction to the tour or any information on our schedule for the day was provided. We ended up sleeping for about an hour. Mary woke us up with some 20 sentences in Spanish followed by a single sentence in English. I begin to think that English is a very efficient language. This happened throughout the tour. Her English was so bad that it was extremely difficult to get any information from her. Sometimes she wouldn't even attempt to translate. We reached Tulum. She shouted some instructions on where to assemble after two hours. The guided tour was better. Mary had old photographs and documents of the ruins. I liked that she kept it interesting. She wouldn't understand the follow-up questions in English but in general, the guided tour part was ok. Tulum ruins are picturesque. The beach is a little muddy though. After the ruins, we were transported to a collectivo van. The driver didnt speak English, and we had no guide. Among the three passengers, one was bilingual. He acted as the translator. The cenote was great. Lockers, life vests, snorkeling equipment, etc. were available for rent. Our final stop for the day was at Playa del Carmen. Unfortunately it started raining when we reached. We had our lunch there and spent some time at the beach. From there we were transported to Cancun. We got to tulum to see the ruins and Sophia, our tour guide was knowledgeable! After we were the only ones staying in the bus while everyone in our tour got on other buses. The new driver then drove us to the cenote but didn't speak English. We didn't have a guide anymore?! Never got our lunch tho. The guide was wonderful and very informative. Unfortunately, the second half of the tour wasn't as memorable. The other guide/driver forgot to give us our lunch that was included. When we asked about it, they refused to compensate the loss of our expenses. Furthermore, there was poor planning in getting us back to our resort. The entire group had to wait over an hour due to the poor planning of the company. See the ruins and swim in the cenotes, but I wouldn't advise going with this company in the future. The cenote was so beautiful, as well as the ruins we saw, great spot for pictures since it's sea side! I would recommend anyone who would be interested in booking a tour for Tulum to do this one!